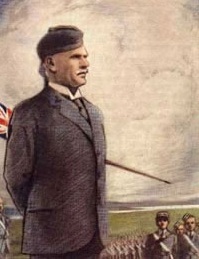 Are you a ‘former member', ‘past member’, ‘old boy' or ‘ex-member’ of The Boys’ Brigade more widely known as the ‘BB’ who perhaps severed your connections or lost touch for whatever reason? Then this could perhaps be the site for you - As a starting point of those past memories and certainly there are links to possible friendships new - So please step inside! SITE NOTICE: If you are viewing this site using a tablet or mobile device, in some cases your viewing experience may be restricted or reduced. I can now only be contacted by emailing me direct (see details at bottom of page) or by using the contact form on this site. 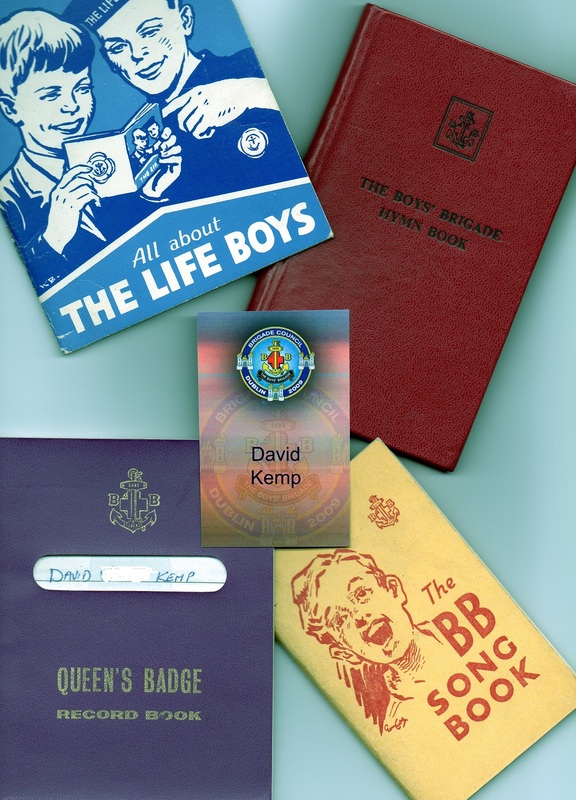 As you are looking at this site, hopefully like me you were in The Boys’ Brigade or 'BB' as it was more widely called, at some point in your life; or perhaps you have a ‘BB’ connection via family members or friends. Either way, a warm "Welcome!!" from me (David Kemp). I get an awful lot of contact from people seeking information about specific people and BB Companies etc..... I do not have access to any records local or nationally. This site was only ever meant as a medium to stir a memory or three; and at the same time, to 'let people know the BB still exists and that a number of ex-BB members still are actively involved through friendship etc even today, via their membership to the Stedfast Association and to the Bugles & Drums of The Stedfast Association (BADOTSA), the latter I formed back in 2000. If you are looking for information on a specific person or BB Company, can I suggest you try and 'Google' the name etc on the internet. How you Google does seem to produce different results; using my old Company as an example I found I got far more results searching LONDON BOYS' BRIGADE - 5th LONDON, than searching 5th London Boys' Brigade! If that does not produce anything, you could try and contact The Boys' Brigade Heritage Society, but I suspect you might have to join them at a cost of £16 as at 2018 to get access (see Links); or perhaps see if there is a Stedfast Association (ex members Association) located nearby to where the Company was based and approach them (currently there are around 20 Stedfast branches in the UK, including London, Glasgow, Manchester and Liverpool - if you go to the London Stedfast Association site and click on their 'contacts' page, they usually list the other UK branch contact details)! A 'Top TIP': - if searching on the net; search both 'BB' and 'Boys' Brigade' as part of any 'Company' title; as sometimes you get different results (based on my experience)! You will also find when searching 'BB' you will get a a lot of results for the TV programme 'Big Brother'. More content will be added to this site as it becomes available...... also please ensure your speakers are turned on! See 'News' page for link to watch other clips of the band during the parade. Did you turn on your speakers? There are a number of video clips/links throughout the site with sound. Working on the basis you are like many others in that you have not had any contact whatsoever with anyone from the Boys’ Brigade past or present over the years, are you aware that the BB still operates here in the UK (albeit in reduced numbers) and is thriving overseas? Sadly you rarely get to hear about the ‘BB’ on television and radio; or read about them in the press compared to the coverage the Scouts get, so I would not be shocked if you had thought the BB had actually ceased. However, if you have had some, but limited, contact with others over the years… Let’s take that as a bonus! Some of these may look familiar to you! Perhaps you will discover within this site and some of its links you have sadly missed out on things including social fellowship and events with kindred spirits in recent years, in particular since 1983. More information on what’s happened since 1983 on other pages. ***News (27/01/16) Having played Euphonium and Bugle at a high level in both Boy's Brigade Bugle and Silver/Brass bands; I am always listening for tunes with great melody lines and boy have I found one.......If only I was 40 years younger, I would be signing up to join up the service band, just to play this march! After months of searching on the internet, for this cracking Quick March I heard, played by HM Royal Marines; I have managed to track down a youtube clip of HM Royal Marines School of Music playing the march called 'JUTLAND' in readiness for an event in August 2015. Thanks should go to 'Blankespoor' for posting this fantastic march on the web! Click below to play the clip. ***News (Updated 10/11/15) Still wanted by me - If you have any kind of promotional material relating to specifically 'BB London District' events (not individual Battalion events) during the period 1968 - 1975 can you contact me please. I am especially interested in the promotional copies of the London Evening Standard and London Evening News that use to be sold on the day. Click the arrow on the photograph immediately below to watch the band in the 2014 parade, which is proceeded by a 'greetings' to the band from me, which I managed to get on air! Return Parade - Click the arrow. I am also aware that BADOTSA would welcome contact from potential new band personnel, especially 'buglers' and in particular those aged 18-30 (but over 30's welcome too), for future events both in the UK and further afield too. 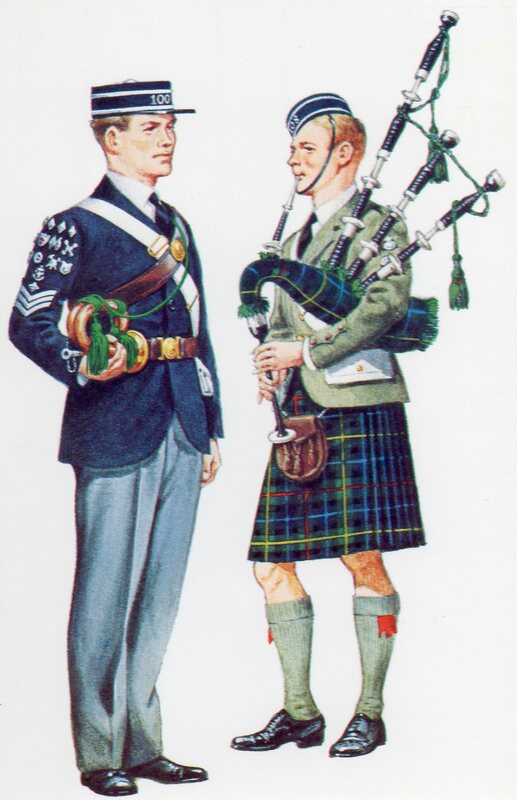 If you play fife/bag pipes; it also might be worth enquiring about possibly joining too, as pipers were part of the band who went to Ypres - If you don't play yourself, but know others who do, tell them! Talking of the band, the following clip was taken from BBC 1 TV live coverage of the band in the Lord Mayor's Show in 2009. I am in there somewhere. Before I forget; 'thanks' to my wife Debs; who again helped to carry the front banner (she also did it in 2006). Click the arrow to view the footage! ****Old news**** -And yes, this is me with another former BB Boy! 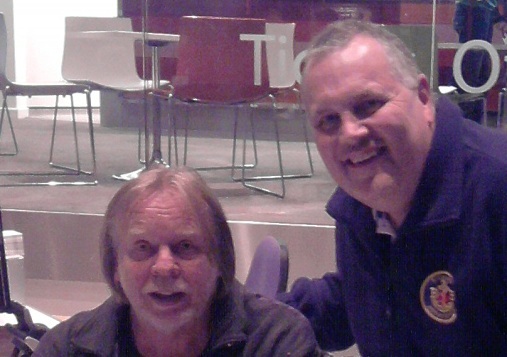 Following an e-mail exchange I get to meet up with a famous musician and former London BB Boy (See Letters / Photos). ****Old news**** - See video link about the life of ex 94th Glasgow BB Boy Bill Millin who sadly died in 2010 but was famously portrayed in the 1962 blockbuster WW2 film 'The Longest Day' playing his pipes as personal piper to The Lord Lovat' leading a column of british/allied soldiers. (see Links / Other Videos). 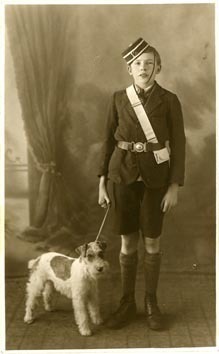 Formed and launched in 1983 at the Royal Albert Hall as part The Boys' Brigade Centenary Celebrations of that same year. Useful information can be found about 'Stedfast' by clicking the link on the left hand menu or by clicking the logo above left. Since 1983 around 20 other branches have been formed in the UK; and more overseas. The origins of the band go back to 2000 when 55 former 'BB' members gathered to play as a 'one off' band. Following a name change or two the band continues to this day and is in great demad for events, carnivals and parades. In 2006, 2009, 2014 & 2017 the band appeared and featured extensively in television coverage (BBC1) at the Lord Mayor's Show Parade in the City of London. Click the logo to be taken automatically to the band's web site. If you are using a laptop/desktop computer and are having difficulty in seeing some of the images/content can you either let me know or try down loading the free download 'Mozilla Firefox' by clicking here. 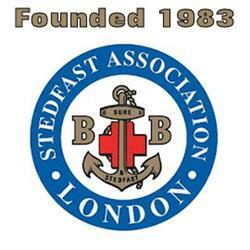 Formed in 1983 for former members of The Boys' Brigade, London Stedfast Association welcomes new members (male or female). Will you be one of them? Click the logo to be taken directly through to their web site.